With our increasingly busy lifestyles, it can be all too easy to take for granted the safe clean water and instant heat that are delivered to our homes and workplaces each day. However, it's often during the autumn when our thoughts turn to switching the heating on that we really appreciate the services of the UK's skilled plumbing and heating engineers. Now in it's third year and organised by the Association of Plumbing and Heating Contractors (APHC), Quality Plumber Week (3rd - 9th October) will be building on the success of previous years to shine a spotlight on the vital role plumbers play in our communities. As well as coming to the rescue when we have a burst pipe or broken boiler, plumbers also provide consumers with the latest advice on heating technologies, energy saving tips and water safety. A key aim of the week, which coincides with the busiest time of the year for plumbers, is to promote the importance of using a quality installer in order to reduce numbers of rogue traders operating in the industry. In order to reduce the number of homeowners who become the victim of "botch jobs", members of the public are being encouraged to ensure their installers have professional qualifications and accreditation to a professional body such as APHC. 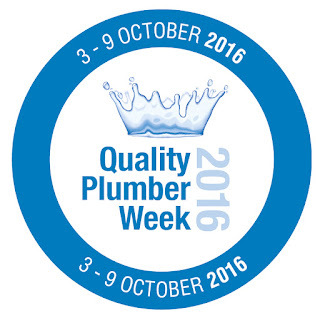 Another focus of Quality Plumber Week 2016 is encouraging more school leavers to consider undertaking a plumbing apprenticeship as a route into a respected profession and an alternative to university. Recent research from APHC shows that attitudes towards apprenticeships appear to have shifted in recent years - 86% of people polled agree that school leavers should be encouraged to consider an apprenticeship rather than being pushed into the Higher Education route, with only 2% disagreeing. Finally, the campaign will be highlighting ongoing work within the industry to improve procedures around the enforcement of Building Regulations, to protect consumers and ensure a level playing field for the UK's truly professional tradesmen. To raise awareness of the week, APHC will be running competitions in the Sun Online and Your Home magazine, so look out for the opportunity to win a weekend break in Bath - linked to history's first master plumbers - the Romans! Keep an eye on the blog for further #QPW16 updates or to find a Quality Plumber in your area today, simply search on the APHC website at http://www.aphc.co.uk/find_an_installer.asp.